Check out the FDA's guidelines for consuming fish that may contain mercury here. Churchill County has experienced a record water year and has had to spread water to all sections of the county to lessen the amount of water in Lahontan Reservoir. This has lead to stagnant water bodies, which are prime conditions for mosquito breeding areas. Unfortunately, with the mosquitoes comes the risk of mosquito-borne illnesses. Testing is being conducted. Please refer to the attached PSA for more information. 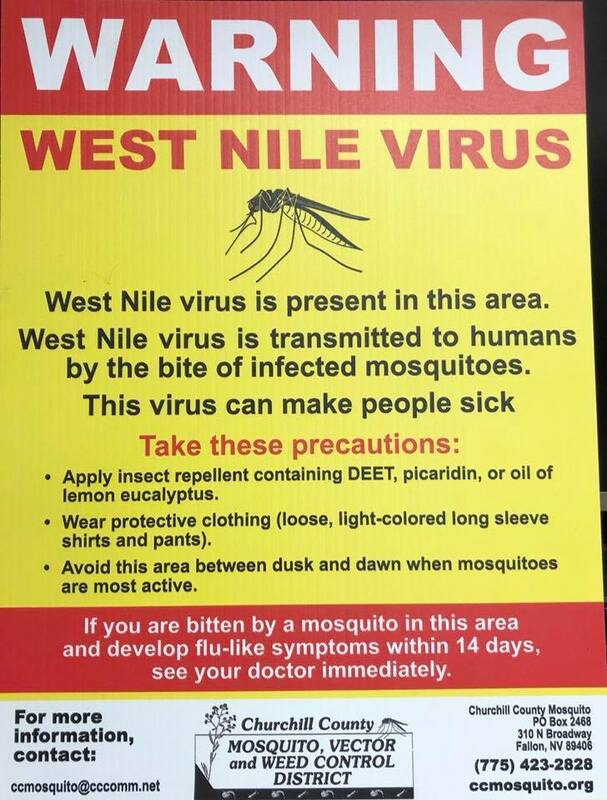 Questions should be directed to the Churchill County Mosquito, Vector, and Noxious Weed Abatement District at 775.423.2828. Please leave your name, address, and phone number when calling. Five confirmed cases of Pertussis (Whooping Cough) have been confirmed in Carson City, Douglas County, and Lyon County. These cases have occurred in partially-immunized children from the ages of 3 months to 4 years of age. While there have been no confirmed cases in Churchill County, your Community Health Nurse is asking that persons with symptoms of Pertussis be examined by a healthcare provider. You can read the full Public Service Announcement here. You may also call the Community Health Nurse at: 775.423.4434.